The Kindle Fire HDX is a big step forward compared to its forebears. It's got a sleek redesign, blazing fast guts, and a few new tricks. Most of all, though, it's the best small tablet you can buy. 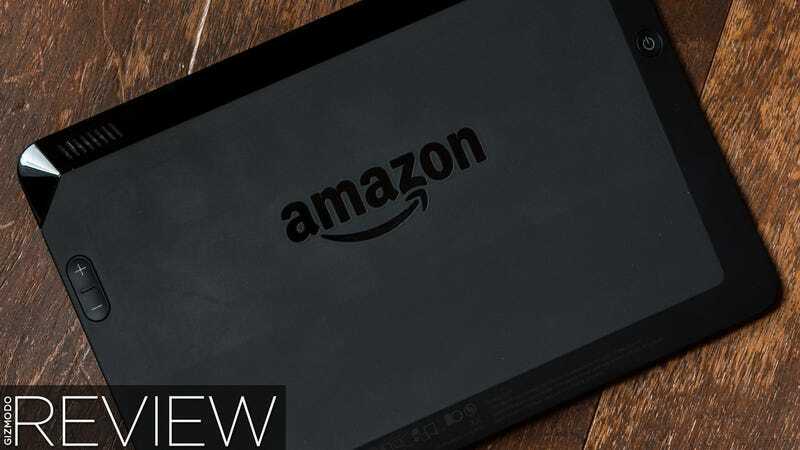 A $230 7-inch tablet that's wired directly to Amazon. The third iteration in the Kindle Fire line, complete with some seriously powerful guts, a wonderful new screen, and an all new build. It's very true to the original Kindle Fire please-use-this-to-buy-stuff-on-Amazon-k-thanks vision, but in the most awesome way yet. Folks who want to dine on movies and books, and who are looped into the Amazon world. Prime members. Your kids, your parents. People who want a fast tablet with a pretty screen and great speakers for a good price. In other words, anyone who wants a tablet in the first place. An angular beauty. Where the original Kindle Fire was basically a rectangle, and the Kindle Fire HD was a subtly curved slab, the HDX is the best of both. The HDX has a sturdy, molded magnesium body, covered in soft-touch plastic that gives a good grip but will be instantly marred by your finger grease forever. The back edges of the HDX are angled back in a sort or trapezoidal way, which is not only visually striking, but makes ergonomic sense; your fingers rest flush against the tapering as they reach further towards the back center. The HDX is a bit more trim than its predecessor. It's less bulky around the edges, thanks to a slightly reduced bezel, but you'll still be hard-pressed to actually put it in your pocket. At 10.9 ounces, the HDX is a lot lighter than the 13.9-ounce Kindle Fire HD, and just a hair less heavy than the 10.7-ounce iPad Mini. The Nexus 7 still wins the portability battle though, weighing in at 10.2 ounces and being slim enough to fit in a pocket. But the HDX is a close second. The buttons are better than on the HDX than they were on the Kindle Fire HD in that they don't require like 10 seconds of hunting to find, but they're still a little awkward. The concave dips are best for fingertips and the worst for finger-sides, so the buttons are only optimal if you hold the tablet by pinching it on the bezels. Who does that? Also, when the tablet is right-side up (landscape, front-facing camera on the top), the volume buttons are on the back right side. Doesn't seem like a big deal until you're fist-first into a bag of chips and an explosion is just a little too loud. A minor gripe, but this is a trick the Nexus 7 gets right. Lefties, you got lucky this time. The speaker placement, on the other hand, is perfect. The Kindle Fire HD was no slouch in the speaker department, but the HDX makes a massive improvement by moving the speakers to the top of the angled back, far away from any accidental finger intrusion. Other tablets sound their most "tablety" as you graze a finger over a speaker and make the whole sound experience of your movie wobble awkwardly, but there's no such danger with the HDX. A joy. When you're just looking at a list of the HDX's guts—2.2GHz quad-core Snapdragon 800, 2GB of RAM—it's almost puzzling why a tablet ostensibly designed for watching movies and reading books/magazines first and foremost needs these sort of muscle car specs. But as soon as you get your hands on it, everything makes an efficient kind of sense. Doing just about anything on the HDX is as pleasant as it is buttery smooth. With a 1920x1200 323 PPI screen—tied with the Nexus 7 2013 and second only to the upcoming HDX 8.9's 339 PPI screen for "highest-res tablet screen of any size"—the HDX has more pixels to push than ever, but they move beautifully. I can (and did!) spend entire minutes swiping through the carousel that acts as the HDX's home screen and just marveling at how fantastic it looks and feels. And of course, that high PPI screen comes in handy for plenty. The high resolution lets videos pulled down from Amazon Prime really shine in high-res glory, and the screen's stellar contrast and deep blacks let it beat the Nexus 7 2013—its screen quality nemesis—when you put them side by side. Books look great on the display, too, crisp enough that you can almost forget you're looking at a LCD screen under the right circumstances. The HDX's ambient light sensor—which will help by adjusting contrast (in addition to just brightness) in direct sunlight—makes an outside, directly sunlit read a little less painful than on other tablets, but it's still an unpleasant enough an experience that you'll want to avoid it. Best of all though, the HDX positively sips battery power in reading mode. We were able to get 17 straight hours of screen-on reading time out of a full charge. And then there's the audio quality, which is almost alarmingly good. There's a low range that really brings out the booms and bangs and the audio just kind of floats around you. It doesn't feel like the audio is coming from the tablet, it feels like it's just there. The Kindle Fire HDX has a number of different software tweaks, but there's one worth noting above all else. Historically the Kindle Fire UI has centered around a carousel. An album-flow of books, movies, apps, and whatever else you've got. It still does, but now, with Fire UI 3.0 you can swipe up and get at a more traditional app drawer. This makes the HDX a whole different kind of tablet. Previously, the Kindle Fire UI had sort of buckled under a heavy load of apps. Not in a processing power way (though sometimes also that), but organizationally. It's been like a backpack; the more you put in the harder it is to get something out. But with this new app drawer option, apps get much, much easier to access on a whim. Before your apps draw was accessible mainly by tapping "Apps" on the top ribbon of categories, where it lived on equal footing with things like "Audiobooks" and "Newsstand." Now, apps are getting a dedicated place to shine right on the home screen, where they belong. And, like a grown-up OS, Fire 3.0 has multitasking that lets you switch between not only between apps, but also books! It's content-level, so multiple books don't all get shoved under the same "books" app, which is smart. This isn't quite as game-changing as the app drawer thing, but still, it's a step towards feeling more like a grown-up tablet. To what extent we could actually test it pre-release, Mayday—the new Kindle Fire video chat support line—works exactly as advertised. I clicked the button and within maybe five seconds I was talking to Jace, who—after confirming my email for security reasons—began to draw on my screen and move his avatar around. It was kind of magical. But even though Mayday doesn't activate your camera, there's something about it that's unnerving. They can't see you, but you'll still feel watched. The arrow was him. The pixellation was me; it just seemed polite. It's worth noting that this Mayday likely isn't under a lot of strain right now. The volume of calls must be pretty low pre-release, and you can bet Amazon has considered the fact that it's primarily reviewers who will be calling in. Still, my experience was nothing but pleasant, and hopefully yours will be too (if you ever have to use it in the first place). And that's the thing; Mayday isn't necessary for gadget freaks, or even anyone who's literate in modern-day touch UI. But it's nice to know that the luddites in your life have someone else to call, someone more convenient and ostensibly more helpful than you are. For the moment there's no way to disable the Mayday button that sits in the notification shade, but we're told a setting for that should be coming before release. Xray for music is another welcome addition on the software side, if not an utterly crucial one. You probably don't need to be able to scan through the entire lyrics of a song, scrubbing back and forth in the audio by clicking the words, but it is also fun. And unlike Xray for movies, which is a valuable source of trivia, and Xray for books, which can be a life-saver for difficult literature, Xray for music is just sort of a toy. Nice when you remember it, but you'll often forget. Movie- and TV-watching on the HDX is revelatory. Between the beautiful screen (if it's playing high-quality content, e.g. Prime or anything hi-res and native), the booming sound, and the hand-comfort afforded by the tablet's angled back, you'll wonder why you bother with a TV. The HDX isn't just a pretty face, or a set of powerful pipes, it's the whole portable package. The overall scrolling, swiping, selecting, and browsing experience on the HDX is equally fantastic. Of course part of that is thanks to the 2.2 GHz processor, but Fire UI's new Jellybean 4.2.2 skeleton also helps. Unlike 2.0, Fire UI 3.0 is post-Project Butter, Google's big initiative to make stock Android fast, smooth, and then more fast, and more smooth. It shows. Fire UI is by its very nature heavy on swipes and bounces, and they all feel good. That consistent ability to do stuff smoothly and without stutters translates to the world of apps too; the Kindle Fire HDX can run just about anything app you can throw at it and run it well. We tried Dead Trigger, a whole flock of Angry Birds, and handful of other games and all ran like a dream. Even with so many pixels to push, it seems like you'd be hard-pressed to throw something at the HDX that it can't handle. And man, it's sort of weird to be saying that about a Kindle Fire. The Kindle Fire HDX's buttons are an improvement on the virtually invisible suckers from the Fire HD, but like we noted, they're still weird. And there are other odd quirks as well. The microUSB port where you'll plug in for charging is angled strangely, for example; the plug slides in parallel to the angled part of the back, but the actual hole faces straight out. That means the cable pokes out at an unnatural-looking angle and plugging in always feels awkward and forced and precarious, like something is going to snap. These aren't huge deals, but these little quirks in fit and finish contribute to an overall sense of strangeness. Or maybe it's more that they detract from an otherwise solid sense of normalcy and rightness. Either way it's a downside. There are some larger issues as well. The Kindle Fire line has never really aspired to be a email-and-calendar machine. This thing is for movies and comic books and reading. It's technically a Kindle, after all. This time, however, the HDX seems to be expanding its horizons a little with serious guts and better-than-ever access to your app drawer. It still falls a bit short though. There are of course large, philosophical issues like the lack of Google apps, but that's not so much a flaw as it is a choice you just might not be fond of. Still, it's a choice that comes with a lot of consequences. The Amazon App Store has better selection than it used too—most big players are there—but it's still cut off from the greater Android world in some meaningful ways. Apps you've already purchased through the Play Store (if any), do not transfer over to a Kindle Fire HDX. App updates pushed out over the Play Store have to come through Amazon before a Kindle gets ahold of them. It's probably easiest not to think of the Kindle Fire as an Android tablet at all; Fire OS is forked so strongly, it's an entirely different experience, with its own rules and, yes, its own apps. The fact that it shares anything with Android at all is more just a bonus than an integral part of what the Fire UI aims to be. On top of that, you don't get access to increasingly killer Google services like Google Now, or Voice Search, and there's no account-syncing between devices like there is when you're strapped into pure Google. It's the price you pay for choosing Amazon (and its great yet affordable hardware). Meanwhile, Fire UI still has some deficiencies of its own. Notifications from any and all apps accumulate as a mere number in the top notification bar, with no sort of more informative pop-up. You'll just see a "1" or a "2" or whatever, and have no idea what they are until you pull down. It's minor, but annoying. And not something you want in your main tablet if you are a Busy Person with Lots of Things to Attend To. Features like threaded email have made it to Fire UI 3.0, but in a way that makes them seem like they are a second priority. Most likely because they are. Amazon's boast of 17 hours of power in reading mode sounds crazy, but it checks out. We were about to get just over 17 with the tablet left on, auto-brightness engaged. We flipped less often than you would if you were actually reading (two or three times each hour), but even 15 or 16 hours would still be a lot of hours. As for our video test (a 10 hour video of Nyan Cat, also auto-brightness) we got the 11 hours Amazon is claiming for video playback. I'd be remiss to not draw at least one more comparison to the iPad Mini, but at the same time it almost feels cruel. It's just not a fair fight. Not only is the Mini a year out of date, but it's also in a different universe of price; the HDX starts at $230, the iPad Mini at $330. But! There's a new iPad Mini just around the corner, and it could be (should be) a big step forward from its predecessor. The HDX is better than last year's iPad Mini, but of course it is. The iPad Mini 2 is going to be a different story. The 7-inch Kindle Fire HDX comes in a few different flavors of storage and connection type. It's $230, $270, and $310 for the 16GB/32GB/64GB models. Then, you can add $100 to each to get Verizon or AT&T LTE. Then, you can add $14 to get rid of special offers AKA lock screen ads. You can also get a weird little foldy magnetic case/stand with your HDX. They're called Origami Cases on account of how they fold up to be stands for landscape or portrait mode. They're actually quite nice, and they attach to the HDX magnetically which is great if you're one to take your cases off a lot (you exhibitionist). But at $65, the price is a little steep, especially for a tablet that feels so nice naked. Like watching things on your tablet? The Kindle Fire HDX has a great screen—the best screen. And, it's got pipes for content hooked right up. Like listening to things on your tablet without headphones? The Kindle Fire HDX has unmatched audio. The speakers have great range, great power, and they're perfectly placed, which is rarer than it should be. Like smooth UI and being able to run whatever apps you want? The Kindle Fire HDX has a crazy processor. That 2.2 GHz quad-core Snapdragon 800 processor is nothing to trifle with, and it's going to continue being a beast for a while. You're not going to find an app (in the Amazon App store) that this sucker won't run nicely. The Nexus 7—with its under-clocked Snapdragon 600—can't touch these guts. Like checking your email and social networks and browsing the web on your tablet? The Kindle Fire HDX does this plenty good. The built-in email app and Silk browser are not best-in-class, but they work fine. They work well. You are by no means getting screwed or even really inconvenienced here unless you have absurdly specific needs. Like reading books? The Kindle HDX is no e-ink slab, but between the contrast-adjusting light sensor and the totally bonkers 17-hour battery life in reading mode, this is the best reading experience you're going to get out of device that's not a devoted ereader. If stock Android and the Play Store is more important than all that, you want a Nexus 7. Duh, you knew that already. But if there was ever a gadget to make you reconsider your (absurd? maybe not, but maybe so!) priorities, this is the one. The Kindle Fire line has often caught flak for not being a real Android tablet (true!) and somehow therefore not being a real tablet in a world of Play Store-enabled 7-inchers (not true!). But really, both of those are meaningless distinctions; the Kindle Fire HDX does the things that tablets do, and in almost every case, it does them the best. But there's one catch: the other big contender for best small tablet of the year—the second revision of the iPad Mini—is still shrouded in mystery and also right around the corner. Apple's big iPad event is (almost certainly) this October, and who knows what the next small iPad has in store. But for the time being, the Kindle HDX has eked out a victory, pulling waaaay ahead on the hardware front in a year where the Nexus 7 sort of let off the gas. There's still time in this race for Apple to make a move, but the HDX has established one hell of a lead to beat. Dimensions: 7.6" x 5.4" x 0.4"